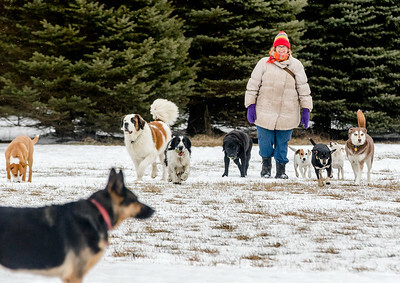 Sarah Nader- snader@shawmedia.com Gloria Tello, canine care taker, exercises some of the 40 dogs at Happy Tails Animal Sanctuary in Bull Valley Thursday, January 28, 2016. The sanctuary is running out of private funds that they've been using to run their sanctuary for years. Forever Husky in Crystal Lake is combining forces with the sanctuary to raise funds and help them jeep going. 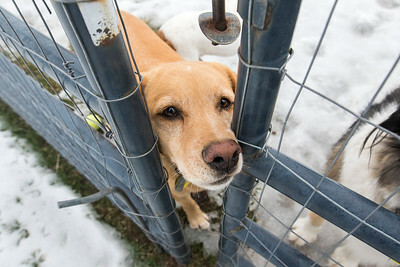 Sarah Nader- snader@shawmedia.com One of the 40 dogs at Happy Tails Animal Sanctuary in Bull Valley plays in the fenced in area Thursday, January 28, 2016. The sanctuary is running out of private funds that they've been using to run their sanctuary for years. Forever Husky in Crystal Lake is combining forces with the sanctuary to raise funds and help them jeep going. 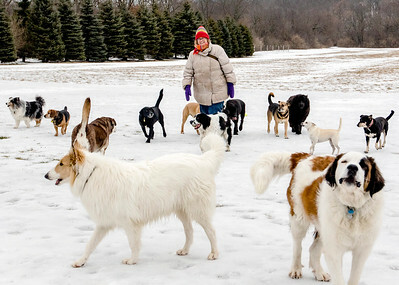 Sarah Nader- snader@shawmedia.com Gloria Tello, canine care taker, plays with one of the 40 dogs at Happy Tails Animal Sanctuary in Bull Valley Thursday, January 28, 2016. The sanctuary is running out of private funds that they've been using to run their sanctuary for years. Forever Husky in Crystal Lake is combining forces with the sanctuary to raise funds and help them jeep going. Sarah Nader- snader@shawmedia.com Rachel Farr, suprivior and vet technician, walks a dog in a wheel chair at Happy Tails Animal Sanctuary in Bull Valley Thursday, January 28, 2016. The sanctuary is running out of private funds that they've been using to run their sanctuary for years. Forever Husky in Crystal Lake is combining forces with the sanctuary to raise funds and help them jeep going. One of the 40 dogs at Happy Tails Animal Sanctuary in Bull Valley plays in the fenced in area Thursday, January 28, 2016. The sanctuary is running out of private funds that they've been using to run their sanctuary for years. Forever Husky in Crystal Lake is combining forces with the sanctuary to raise funds and help them jeep going.